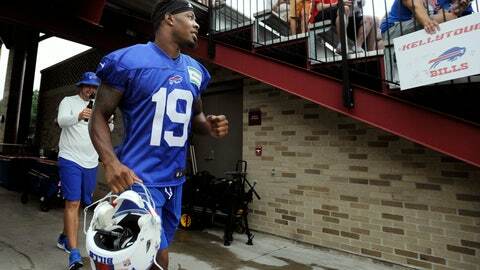 PITTSFORD, N.Y. (AP) — Two years removed from being a first-round draft pick, receiver Corey Coleman vows he’s got plenty to prove with the Buffalo Bills after falling well short of expectations in Cleveland. That’s the message Coleman posted on his Instagram account along with a video of him showing off his new Bills No. 19 jersey. And it’s something Coleman repeated following his first practice at Bills training camp Tuesday, two days after being acquired in a trade with the Browns. The Bills are providing Coleman a fresh start after his two-year tenure in Cleveland was beset by injuries and dropped passes. As an indication of how far his stock has fallen, Buffalo gave up a 2020 seventh-round pick to acquire the 15th player selected in the 2016 draft. “A lot of things don’t work out the way you want it to work out,” Coleman said. If only the Browns and their fans could do the same so easily. Traded by first-year general manager John Dorsey, Coleman came to symbolize the overall dysfunction of the Browns’ previous regime, which passed on drafting current Eagles starting quarterback Carson Wentz by trading down and selecting the Baylor receiver. Injuries limited Coleman to playing 19 games, during which he caught 56 of the 131 passes thrown in his direction for 718 yards and five touchdowns. And he will forever be remembered in Cleveland for dropping a pass late in the fourth quarter in last season’s finale at Pittsburgh that sealed the Browns’ 0-16 finish. The Bills took what GM Brandon Beane called “a low-risk” gamble in a bid to address a need at a position that lacks experienced and proven talent behind starter Kelvin Benjamin. Coleman also has the opportunity to provide the Bills’ retooled offense an element of downfield speed to keep opposing defenses from crowding the line to stop the run. As for expectations, McDermott wants to provide Coleman time to learn the playbook and become comfortable with his new teammates and surroundings. “Can’t wait to watch him really just blossom into the player we believe he can become,” McDermott said. Coleman practiced on a limited basis Tuesday, and it’s unclear whether he’ll play in Buffalo’s preseason opener against Carolina on Thursday. He appreciates the amount of catching up he has ahead. NOTES: McDermott wasn’t prepared to announce who will start at quarterback against the Panthers. Offseason free-agent addition AJ McCarron and returning backup Nathan Peterman have split time with the starters for the first two weeks of training camp, while rookie first-round pick Josh Allen continues to mostly work with the third-string offense. … LB Trent Murphy, an offseason free-agent addition, isn’t expected to play after missing the past week with a groin injury. McDermott expects Murphy to resume practicing next week.